The remanufactured Precor C956 treadmill is a workhorse commercial machine that has been upgraded and reconditioned to perform and function like new. You can save thousands of dollars and enjoy years of punishing use by buying a former club treadmill. The console on the Precor C956 treadmill has a new Touch Sensitive display that allows you to access the 21 programs and choose from Manual, Random, Track, Weight Loss, 5k Course, Aerobic (2), Cross Country (3), Custom, Fitness Test, Gluteal (2), Goal (2), Heart Rate, and Interval (4). The LCD display shows Speed, Time, Calories, Calories/Minute, Distance, Heart Rate, Incline, METs, Pace, Profile, Segment Time, and the SmartRate® Heart Rate readout. UPDATE: The Precor C956 model has been discontinued and is no longer available. Check out the latest Precor treadmills at the company store to find a comparable model on sale. A commercial model that has been around for 10 years, the Precor C956 treadmill has been updated to the latest Precor technologies including the Ground Effect Impact Control™ System that ensures a soft cushioned running surface. The Integrated Footplant™ Technology accommodates foot speed with each changing step. Designed for minimal maintenance, the Precor C956 has a cool-running 3.2 hp continuous duty motor for heavy-duty power and torque (commercial treadmills are designed to be used 12-18 hours per day). It has a 10-year track record of reliability in the health clubs and fitness centers. 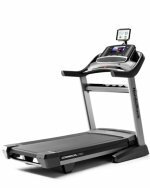 Treadmill reviewers have been uniformly positive on the Precor C956, lauding its generous belt of 20" x 60", a big 15% incline, 12mph speed, and 400-pound user capacity. Maintenance is a breeze since it features advanced diagnostics, modular system, solid-state drivers, reversible deck, and a self-lubricating belt system. The C956 also features the SmartRate® Polar Heart Rate readout which shows you when you are exercising in your Target Heart Rate Zone during cardio workout. 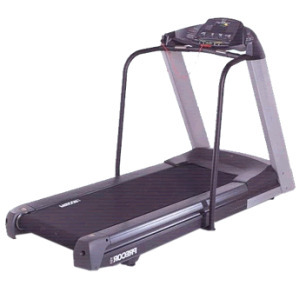 The Precor C956 treadmill is available as a reconditioned model for around $2,395. When a machine is completely refurbished, it is disassembled and rebuilt from the ground up. In addition, new parts and electronics are installed and, when applicable, even upgraded to reflect the latest technology. Your best bet when buying a reconditioned Precor: buy from an established and authorized treadmill dealer and you’ll get Free Shipping, a 31-day Money Back Guarantee, and Lifetime Technical support at a toll free number. The average age of their refurbished Precor treadmills is usually 3 to 4 years.